Looking for all-day breakfast in Vancouver? Jethro’s is the perfect spot for you. Thanks to Vancouver’s abundance of comfort food and all-day breakfast joints, I’d like to think we’re ready for the dark months, which are creeping dangerously close. Jethro’s Fine Grub, an 8-seater hole-in-the-wall nestled in peaceful Dunbar, is one of my new favorite spots to lunch on eggs, pancakes, and more past the morning hours. 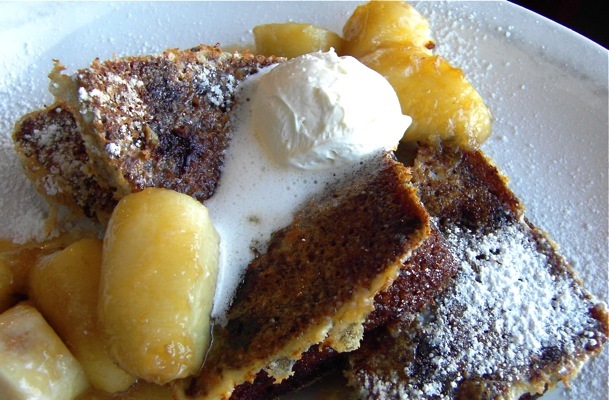 Being a serious banana bread enthusiast, I couldn’t resist their version, dolled up as French toast. Mistaking the dish’s whipped butter topping for whipped cream was a blessing in disguise. Never would I have included so much on my first bite — but, wow. The intense pleasure caused an ‘eyes shut’ reaction. The two slices of chocolate chip-riddled bread — battered lightly in egg mixture — were moist, rich, and surrounded by caramelized bananas. Heaven? Yes. Autumn? Sure! Other all-day breakfast spots include The Templeton, Central Bistro (both until 3pm) and Deacon’s Corner.